Q: How is your window cleaning Heston going to bring back the transparency of my windows? Interior window wiping – The experts will remove stains with ladders and squeegees. Q: Can you rinse my casements during harsh weather? A: If you spot rainy clouds on the day of your appointment, don't be upset. The window cleaners in Heston can still carry out the service as long as they're facing a light rain. However, in the event of a downpour, we will kindly ask you to reschedule your appointment to avoid any mishaps. A: Yes, you can! The cleaning team will need a free parking space in close proximity to your premises (30 metres or less) and on the same side of your panes. Q: Do I need to meet the experts in person? 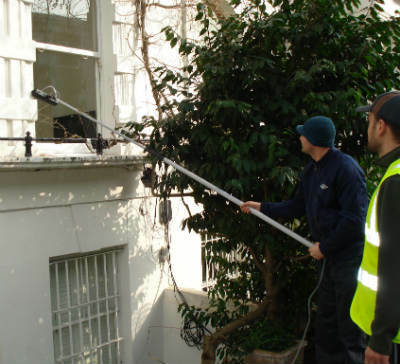 A: It's no problem for the specialists to wash the exterior surfaces of your windows as long as they are free to enter through your front gates. And if blemishes have landed on your interior surfaces as well, just let us know and we'll perform a free key pick-up and delivery. Q: What if my cleaner has been delayed? A: We will promptly inform you about the cause of the expert's delay and notify you once he appears near your building. Q: Can you polish PVC window elements? A: Yes we're certified to clean any type of casement or window accessory. What's more, every PVC or UPVC frame or sill will be polished for free! Q: What about stained glass panes? A: Yes, we can, but we'll only wash the exterior surfaces with the water-fed rod. After going through lots of client feedback, we've changed our window cleaning Heston's rates. Now, you can schedule our service at prices that are nothing short of competitive! For further details, please check out our price table below. With window cleaning in Heston, we can improve the appeal of your premises even if it scrapes the clouds above. Let's see what you'll get once you book our custom-tailored service. For external window washing, the Heston window cleaners will deploy a telescopic water-fed pole. A water pump inside the team's van will send purified water up the hose and out of a brush-head extension. The water, in unison with the brush-head, will erase any traces of filth from the panes of any four-storey premises. With rope access window washing, the specialists will use sturdy climbing tools to reach even the uppermost floors in your commersial or home property. We own all required COSHH documentation and risk appraisal reports and can send them to you as soon as you need them. In addition, we frequently check the washing gear to ensure that your session will go without a hitch. And to wipe every inside corner of your panes, the experienced team will use the established sponge and ladder cleaning method. We are delighted to announce that our window cleaning in Heston has been requested by several adjacent regions as well. You can see which locations we visit below. Alternatively, get a free instant quote or order affordable window cleaning services Heston TW5 online, through our web site.